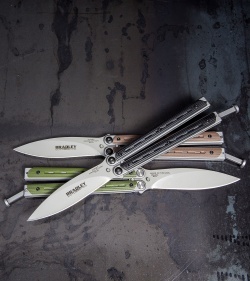 Bradley Kimura butterfly knives made a comeback at Blade Show 2018! This model has coyote brown G-10 scales and a 154CM stainless steel spear point blade. 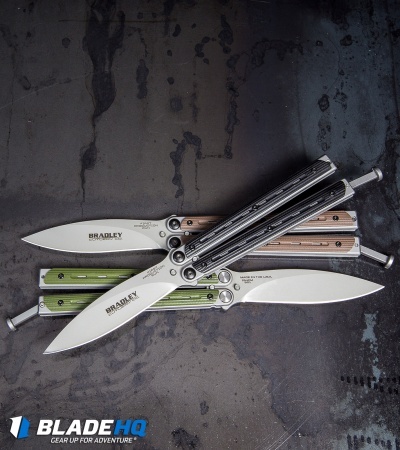 The latch is reversible so you can adjust the knife to your flipping preference. It can be taken apart with a few torx bits for easy maintenance. 154CM steel for terrific edge retention and corrosion resistance. G-10 handle scales that offer excellent grip. Engraved blade with "Bradley Cutlery" and "First Production Run". I purchased this knife after reading bad reviews and watching videos of people bashing this knife. So, I bought it. It was a little stiff at first, but like most knives, it needed work. Also, it’s a little heavy but that makes it more fun to handle in my opinion. Right now it’s as loose as a goose and have had zero issues with it. The tang pin at the bottom of the blade fell out. Now, the latch won't close securely as it is too loose. Pity - it was my first bali and I don't know how to fix it. I got this knife to carry daily. Over all it is good for that but do not get this knife to use for flipping tricks it will work but not that well balance is off. One weird thing I found is the pivot screws are two different torque bit sizes???? I’m pretty sure this must be a fluke but it works out for the best because it helps me keep track of the screw I just adjusted when I was getting it to that sweet spot. 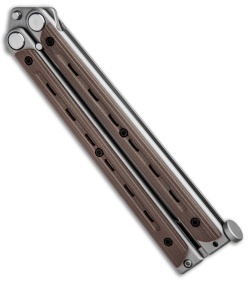 This is my first high quality Bali and I love it. Though the bearings come very tight it is still great for flipping all you have to do is lossen them. the G-10 make it very gripy and allow it to rotate and fan. People conplane that it is to heavy, but all you have to do is get used to it. If the is is one of your first quality knives then perhaps you have been 10 dollar amazon trainer and that is about the same weight. Overal my favorate knife ever. 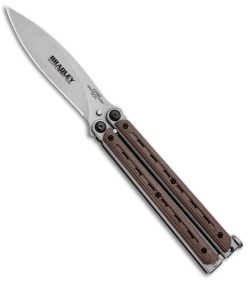 This is my first decently nice balisong I bought to learn tricks. Let me start by saying im not a "pro" flipper or collector but it's a very well made nice feeling knife it comes shaving sharp out of the box... tape the blade if you arent a pro or you will F yourself up proper no joke. it is a bit stiff at first but is super smooth after breaking it in I havent even had to tighten anything yet after dropping it many many times on carpet and soft things. No complaints at all about this knife it just all around is very nice for the price and made in the us. Would definieltey buy again. I own many knives and this is my first balisong. I think this new Kimura is the right price for the quality. The blade came razor sharp and I cannot see any imperfections with the overall knife. The pivots were a little tight and I was able to adjust them without much issue. Strangely, the torx screws are different sizes on each pivot. It seems like other buyers have had a bit of a crap shoot with quality, so I may have been a little lucky with the one I received. The knife flips really smooth. It’s built well and feels like it can take some abuse. Besides being stiff out of the box, I’ve had no problems. Yes, the tang pin is off center but big deal. Thank you HQ for the surprise. I received it on 9/1 and I thought they weren’t going to ship until mid September. Was not expecting it so I was like a kid at Christmas. I was cautious when ordering this knife because I had seen a good amount of unfavorable reviews on it. I can now say that I am pleasantly surprised to find that the knife that I got had none of the issues I had seen in those reviews. The knife is fantastic. The bronze washers produce a butter smooth flipping action. I didn’t have to adjust any of the pivot screws, it was just fine out of the box. Having a great balance and overall feel to the knife, it is a great flipper. The lock is very good and solid in both the open and closed position. The blade has zero play in any direction when locked in the open position. The g10 scales are very comfortable, while still remaining quite grippy. The spine of the blade is also nicely chamfered so it feels great when flipping. In my opinion, it is a well made knife and I may even order one of the other colors in the near future. Normally I dont write reviews but after reading the 2 negative reviews for the Bradley Kimura I wanted to add my input. So what is my verdict on this balisong?......freaking awesome. I was reading the comments above and yes it does come covered in oil but correct me if I'm wrong that was to prevent the rust. After a few uses the oil goes away. Now as far a play goes with the blade this thing is smooth and feels tight. Again I'm not expert but I do not feel any extra play like the previous person commented. This blade is the best bang for your buck if you are looking to have a 200-300 dollar blade for the price of 120. Will definitely reccomend to anybody. 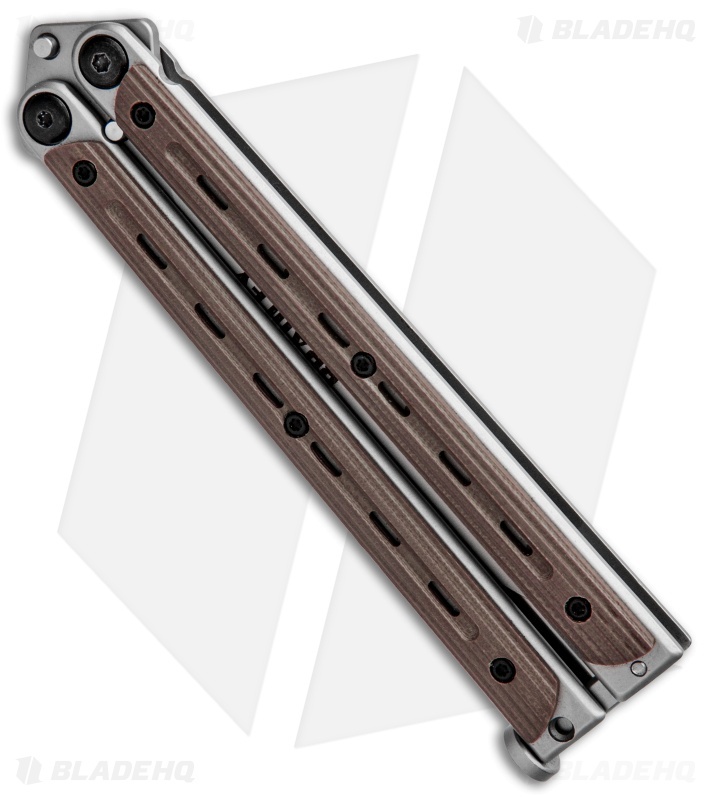 I've been into balisongs for coming up on six years now, and I'm not usually the review writing type (nor, it should be noted, am I the world's greatest flipper). However, I have some issues with the 2018 Bradley Kimura that I feel I should mention. I haven't had the knife long as of this writing but the problems were fairly obvious. First off, the good: mine flips fine (though it started a bit stiff, it did loosen), and has a nice weight to it. Now the issues: The latch was very loose and needed tightening (not the end of the world there). The pivot screws were dinged and scratched up pretty badly, though not a write off, I don't think. And the tang pins come farther out on one side than the other. These all seem to be presentation issues, though. And for me none are deal breakers. Just don't expect anything close to perfection at this price point. Oh, and great service from BHQ, as always.